New Delhi: Chances are by the time you finish reading this story, this will become your idea of a dream wedding. Meghan Butler, a lawyer from North Carolina has set the most paw-dorable wedding trend. 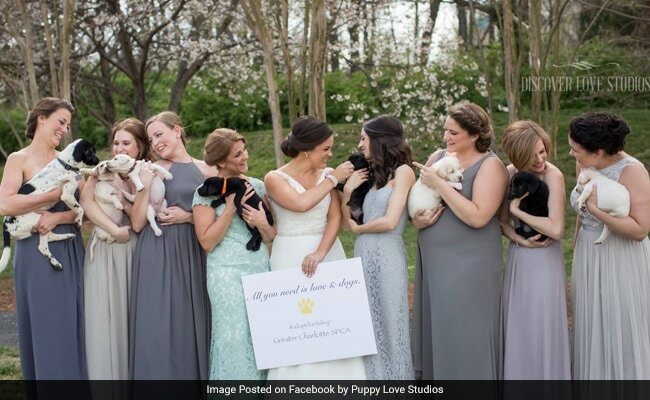 Instead of the usual tradition of bridesmaids holding bouquets while walking down the aisle, she made her eight bridesmaids carry 8 rescue puppies instead. Meghan and her husband Brett are proud parents of four furry babies - two cats and two dogs. All of them adopted. The couple wanted to raise awareness about the local animal shelter and thought rescue puppies would be the best idea to do that. One of her bridesmaids who is a foster mom for the shelter. arranged for the pups for her friend's big day. "She's the one who facilitated it and really got it all going. They had handlers come out and take care of all the puppies and it worked out so well," she told ABC News. The guests had a paw-some time at the wedding with the furry addition to the guestlist. "We only had a few minutes, but those few minutes with the puppies changed the whole course of the day. Everyone lit up, like most do when they see a puppy!" their wedding photographer Brittany Boland wrote on her website. The couple also made a donation to the animal shelter instead of giving party favours to the guests. As for the cherry on top - all of those puppies found permanent homes soon after the wedding. "This is near and dear to my heart and to be able to bring awareness to the need for adoptions - that was the best part of my wedding. Besides marrying Brett of course!" the bride told People Magazine.